We entered Holy Week this past Sunday. Holy Week for Christians around the world is the most sacred time of the year and central to our faith. During Holy Week we are invited to spend intentional time with Jesus and with God as we walk towards the cross of Good Friday longing for the resurrection joy of Easter Sunday. There are a number of worship services over the next few days. You are invited to gather as you are able with friends and family members. Thursday evening, April 18 is our Joint Maundy Thursday Service at St. James, 6:30 p.m. In prayers, scripture readings, meditations and sacred music we take part in three events that took place during Jesus' last night with his friends before he is handed over to be crucified: his washing of his disciples' feet (we symbolically wash hands), his commandment to love one another as he loves us and his call to us when we celebrate Holy Communion (which we will on Thursday evening) to "When you do this, Remember Me." On Good Friday, April 19, we gather at 10 a.m. with our Presbyterian and Anglican friends at St. Andrew's Presbyterian, Kars for our Ecumenical Good Friday service and walk with the cross. In scripture readings, poetry, prayers and hymns, we mark the last day of Jesus' life. Worship starts at St. Andrew's and then, as we are able, we walk with and carry the cross for a time of worship at various points in Kars including at St. John the Baptist Anglican church. We finish our Good Friday worship at Trinity United. If you cannot walk long distances, feel free to drive from stop to stop. It's more important that you are present as you are able. Easter Sunday, April 21 begins with a Joint Easter sunrise service. We gather at St. James at 7:30 and walk to the Osgoode Peace Park for a time of worship followed by a light breakfast at St. James. Our Joyful Easter Celebration of "Alleluias in the Air! Christ is Risen!" takes place at St. James (9:30 a.m) and Trinity (11 a.m.). Be prepared to sing, shout Alleluias, enjoy laughter and celebrate the Good News of Resurrection and New Life! Both Trinity and St. James Easter services include the Sacrament of Holy Communion. Let us join together as the Body of Christ to give God our thanks as people of the Resurrection. All are welcome at one or all of our services: the older, the little ones and everyone in-between. You. Belong. Here! See you once, twice or many times this week as we walk to Jerusalem and to new life on Easter morning. Happy Friday to you. I trust this note finds you contented and smiling. The temperature is warming ever so slowly, the Rideau River and various creeks are opening up and God's creation is slowly awakening to new life. Spring is my favourite time of the year - new life is emerging. I have the same feeling about the Season of Lent and Holy Week - my favourite time of the Christian year. New life - both physical and spiritual is all around us. This Sunday, April 14, we gather at worship (St. James at 9:30 a.m., Trinity at 11 a.m.) to sing, pray and hear God's living words for us. Sunday marks the beginning of Holy Week and we begin the sacred journey through the last days of Jesus' life. This Sunday we shall hear and live again the Palm-Passion story: from Jesus' joyous entry into Jerusalem (and waving palm fronds) to the mockery of a trial and his crucifixion. Our scripture readings are selections from the Gospel of Luke, Chapters 19, 22 and 23. While we may have heard these scripture readings many times over the years, these readings are central to our faith - you cannot skip them if you want to arrive at the Good News of Easter Sunday. As I sit with our readings, I can't help but reflect on Jesus the Christ crucified yesterday and today. Where might you see the Living Christ crucified today? Where might you see God's beautiful creation crucified today? As we consider where crucifixion is taking place in our lives and in our world, where might you see the hope of resurrection to new life? Please join in worship this Sunday to hear and reflect upon the last few days of Jesus' life. All are welcome. As next week is Holy Week, there are several worship services planned in addition to this Sunday's worship. We have a Joint Maundy Thursday service, 6:30 p.m., April 18 at St. James. In sacred music, scripture and prayers we gather to participate in hand washing and the Sacrament of Holy Communion as we hear of Jesus' last night with his friends. On Good Friday, April 19, we join with our Presbyterian and Anglican friends as we journey with the cross in Kars beginning at St. Andrew's Presbyterian at 10 a.m., stopping along the way, ending at Trinity United. On Easter Sunday, April 21, we are invited to our Joint Easter Sunrise service in Osgoode at 7:30 a.m. (at the Peace Park by the post office) followed by a light breakfast at St. James. And, a few hours later Easter Sunday, April 21, we will have joyful, Alleluia filled Easter worship services, 9:30 a.m. at St. James and 11 a.m. at Trinity with the Sacrament of Holy Communion. Invite your family and friends to join you at any or all our Holy Week services. Everyone is welcome. Without exception. Without condition. P.S. Are you hungry? Thinking of breakfast? Did you just think - I am indeed looking for a delicious, leisurely Saturday morning breakfast? St. James is the place to be on Saturday morning for a hearty community breakfast from 8 a.m. to 10 a.m. Great food, exceptional people, abundant conversation and laughter. All are welcome. Free-will offering. And, an inside scoop just for you the reader. There seems to be an Easter theme at the breakfast tables especially if you took on eating chocolate for Lent. Let's just say you will be delighted! Happy Friday to you wherever you may be and whenever you happen to read this note. What a beautiful sunny morning it is. We gather at worship this Fifth Sunday in Lent at St. James, 9:30 a.m. and Trinity at 11 a.m. This is the last Sunday in Lent as next Sunday, April 14 is the beginning of Holy Week. More about Holy Week below. Our Scripture readings this Sunday are from the Book of Isaiah, Chapter 43, verses 16 through 21 and the Gospel of John, Chapter 12, verses 1 through 8. In our first reading from Isaiah, the writer is speaking to the exiled people of Judah living in Babylon. Apparently many are becoming quite "rooted" and even prosperous in this foreign land, perhaps forgetting that they belong to God. Isaiah promises that God is going to do a new thing: a new creation shall spring forth. Isaiah invites his listeners then, and us now, not to look back at what has happened in our past, but to look and see the ways that God is bringing new life within us and around us. In our Gospel reading, Jesus is in Bethany, on the outskirts of Jerusalem, and has gathered with friends over a meal. At some point, Mary (sister of Lazarus whom Jesus raised from the dead), gets up from the meal and anoints Jesus' feet and wipes them with her hair. Mary understands that Jesus is walking towards his death. Judas (who will betray Jesus for a measly 30 pieces of silver) complains loudly and berates her for what she has done. Mary has done this beautiful act of love and compassion for the One walking towards his death. Would we do the same whatever the expense? Let us explore together God's Living Words for us this Sunday. Holy Week begins next Sunday - April 14. Please see the attached poster outlining our Holy Week services beginning with Palm-Passion Sunday April 14. At worship this Sunday, a copy of the poster is inserted in each worship bulletin for you to take home for easy reference. How about inviting a friend or family member to join you at worship this Holy Week? For St. James only - please note that an appeal is underway for the St. James Memorial Flower Fund. If you wish to dedicate flowers in memory of someone (flowers will be displayed Easter Sunday before being delivered to various households), please complete the form given out last Sunday which is also available at the doors to the church. Deadline to respond is April 14. Blessings on your Friday and hope to see you on Sunday. While Hallelujahs have been put away for the Season of Lent, how I wish to proclaim one now that we are at the end of March. We knew we would get here, but back in January, February, and even a few weeks ago it seemed we would never get to the end of winter and on to spring. Quietly, I will say to myself this coming Monday, Hallelujah, it is April and April showers will bring May flowers! This Sunday is the Fourth Sunday in the Season of Lent. We are more than half-way on our journey to Good Friday and Easter Sunday. All are welcome to gather for worship at St. James, 9:30 a.m. and Trinity, 11 a.m.
Our Scripture readings are from the Book of Joshua, Chapter 5, verses 9 through 12 and the Gospel of Luke, Chapter 15, verses 1 through 3 and 11b through 32. In our reading from Joshua, we hear of the dawn of a new day, the past has been rolled away. The people who have wandered for over 40 years in the desert have begun a new chapter in their journey to wholeness. They no longer eat the food of the desert but instead the food of the new land. Through the growth and harvest of this meal, they are reminded of God's abundant love, blessings and peace and healing. Our Gospel reading is the well-known story of the "Prodigal Son." You know this story: the son who wandered away, squandered his wealth and comes back home empty-handed and with his head hanging low to be greeted in love by his father with a great big feast. His father is happy his son has re-turned. His older brother who stayed home and toiled away helping support the family is angry that the return of his younger brother is being celebrated. Oh, family dynamics of yesterday, family dynamics of today. As I reflect on this text, I wonder, would we welcome back the one who we think has squandered away their life? Would we welcome anyone who we think or judge to have made bad choices or to have taken the wrong path? Would you welcome with love and open arms a family member - a mom or dad, sister or brother, son or daughter, an in-law who hurt you or followed a path you thought so wrong? How about a friend who wronged you? And, as a community of faith - would we truly welcome and love someone, saying, welcome home, who may have made choices we don't agree with or who appear so different from us? Let's get together this Sunday to hear the still quiet voice of God this Fourth Sunday in Lent, saying to us "And God says Welcome Home." And a teaser - there shall be a beautiful musical surprise on Sunday! Come, hear it and give thanks to God. Do remember that tomorrow, March 30, Trinity Kars is hosting an e-waste electronics recycling event from 9 a.m. - 3 p.m. Computers, monitors, TVs, cell phones, game consoles, printers, cables, wires, microwaves, scrap metal, audio equipment, etc. are wanted. Please no air conditioners, fridges or liquids. Happy weekend wherever you may be or go. See you Sunday. Welcome to the third day of Spring! Snowbanks melting! Asphalt glistening! Birds singing! Can you feel it? Can you hear it? Are you loving it? I am, as are the few hardy folks I've seen walking about in shorts these past few days. A wee bit too early for that but they didn't ask me for my fashion advice! We are invited to gather in community this Sunday as we continue our Lenten Journey to the cross of Good Friday. All are welcome to join in at worship: St. James, 9:30 a.m. and Trinity at 11 a.m.
Also this Sunday, we receive our 3rd Lenten Challenge. Are you ready? You have until Sunday morning to complete the Week 2 Challenge. I do hope you're enjoying them and that they give you pause for holy thought, holy action and holy conversations. I draw your attention in particular to the E-Waste initiative that Trinity Kars is hosting March 30. You've got a week to clean out your closets (and basements) of all unwanted and broken e-waste. Blessings on your Friday and your weekend. What a lovely Friday it is. I am hearing and seeing "drip, drip, drip" of melting snow and ice as winter ebbs away. And to see bare asphalt in places in the parking lot is a joy! After what seems like a very long winter, I take my joys where I can get them. We are called to gather in community this Sunday as we continue our Lenten Journey to the cross of Good Friday. All are welcome to join us at worship: St. James, 9:30 a.m. and Trinity at 11 a.m.
Our Scripture readings this Sunday are from the Book of Genesis, Chapter 15, verses 1 through 12 and 17 through 18 and the Gospel of Luke, Chapter 13, verses 31 through 35. Our first reading speaks of trust in God even as we may experience disappointments, challenges, fears and uncertainties each day of our lives as Abram and Sarai did. Our Gospel reading speaks of listening for and hearing the quiet voice of God and keeping true to one's faith and one's mission when others would distract you. What might be something that distracts you this Season of Lent? Last Sunday we also kicked off our weekly Lenten Challenge (printed on the back of the worship bulletin). This Sunday a new challenge is coming your way. Are you ready? Weekly announcements are attached. Have a great weekend wherever you may be and see you Sunday morning. Good afternoon to you. I hope you've had a fine week. I have a bit of a longer message this week. This being International Woman's Day we celebrate women and girls in our communities of faith, in Canada and around the world, pointing to each and every one of us to join together to build a more just and inclusive world. We are indebted to the gifts and work that women and girls undertake locally and globally. My thanks and deep appreciation. Our collective thanks and deep appreciation. The Season of Lent, of re-turning to God, is upon us. Lent began on Ash Wednesday this week and it was good to see a number of you at our reflective and intimate Joint Ash Wednesday services. This Sunday is the First Sunday in Lent. We have begun our journey with Jesus to the cross of Good Friday. On Sunday, we mark the beginning of our Lenten Journey in words, prayers, diminishing light, singing and by gathering around God's table for the Sacrament of Holy Communion. And, there will also be a Lenten Challenge asked of you (and you'll be asked each Sunday in Lent to undertake a Lenten Challenge as a spiritual practice). St. James worships at 9:30 a.m. and Trinity at 11 a.m. Please come and journey with your friends and with Jesus. All are welcome. I also share a link to the United of Church of Canada Moderator's (Right Rev. Richard Bott) Message for Lent. He asks a wonderful question of all of us at this time of year: "How Is It with Your Soul?" Click here for the link to the video message (and at the bottom of that page you'll find a transcript of his message). Our Scripture readings are the Book of Deuteronomy, Chapter 26, verses 1 through 11 and the Gospel of Luke, Chapter 4, verses 1 through 13. Our first reading emphasizes a remembering of God's guidance that leads to places of life. In our Gospel reading, we hear the story, familiar to some, of Jesus spending 40 days and 40 nights in the wilderness being tempted by the "devil" three times. Each time, Jesus quotes scripture to refute the "devil." Forty days and forty nights. That is a long time to spend by oneself in the wilderness. How would you handle that? What might consume your thoughts and your dreams (or nightmares)? Let's gather this Sunday to talk about "Uncomfortable Places" as we spend our own time during Lent in the wilderness or we recall times of wilderness experiences - adrift and lonely. Before I see you Sunday morning, might I see you at two fundraising events taking place at Trinity and St. James this weekend? Trinity hosts a Chili Supper tonight - Friday from 4:30-6:30 p.m. Invite your friends, family and neighbours to meet up for dinner at Trinity with delicious home-made chili, salads, dinner rolls, refreshments and dessert. Adults $15, kids under 12, free. All are welcome and take out available. There will be veggie options as well. And, having had chili for dinner, why not keep at the theme of not cooking by stopping in for breakfast Saturday morning at St. James. St. James hosts their monthly Community Breakfast from 8 to 10 a.m. All welcome. Great food, laughter and being together. Free-will offering. And, last but not least, clocks Spring Forward at 2 a.m. Sunday morning. Might I suggest you turn your clocks ahead one hour before you go to bed Saturday night. We'd truly be sorry (okay, maybe laughing) if you were to show up for church as church was letting out. See you tonight, tomorrow and/or Sunday morning. P.S. For those lucky enough to be escaping for "March Break" this coming week may you have wonderful and relaxing moments with those you love and may you return to us safely. And a happy Friday to you. It is March 1. A brand new month. And, only 19 more days til the first day of Spring (March 20). Oh, how I long for Spring especially after reading an email message from a blog I follow - from a much warmer and southerly place. The email said in part "the birds are on the move, returning to northern climates." In the meantime, I do note that skunks in our neighbourhood seem to be emerging from their winter dens (silly skunks don't truly hibernate) foraging for food among all the ice and snow. Good luck with that I say. And how do I know they are emerging? The telltale sign on Thursday morning was the smell. The stink. It would seem at least one skunk felt the need to leave its calling card aimed at our front porch. This Sunday we gather at St. James for joint worship at 9:30 a.m. As we worship, sing and pray we shall conduct the business of St. James for it is St. James Annual Meeting. Please attend to ensure we have quorum and do bring your copy of the Annual Report (previously distributed by email and in paper to those without email). Our time in community with one another and with God will be followed by a time of fellowship, refreshments and goodies in the church hall. Please join with us to share your wisdom and dreams for the St. James faith community. All are welcome. Our Scripture reading this Sunday is from the Gospel of Luke, Chapter 9, verses 28 thru 36. In this text, Jesus takes James, John and Peter up the mountain to pray and to carve out a space and time to invite an encounter with God. Today we tend to see the presence of God, the presence of the Holy in all people and all places. But I wonder, how can we today create places for deep, intimate and sacred encounters with the Holy? Is church one place? Are there others? Lent begins this Wednesday, March 6. You are invited to our Ash Wednesday joint services at St. James. One will be at 3 p.m. and the other at 6:30 p.m. Both services include reflective Taizé music, responsive readings, prayer, scripture, the imposition of ashes and the Sacrament of Holy Communion as we begin our journey to the cross. These are services that are holy, sacred and so unlike Sunday worship. Come prepared to engage with God in a new yet old way. Everyone is welcome. Bring a friend. I also draw to your attention that Trinity United is issuing a "shout out" to its members for volunteers and food contributions for next Friday's Chili Supper. Will Pearl shares that there is a need for rolls, salads, desserts and helpers. You can call Will @ 613-327-9785 or email him at William@willpearl.ca to sign up and share how you might help. All gifts of labour and hands are appreciated. Blessings on your Friday and weekend. I look forward to seeing you at Joint Service at St. James, 9:30 a.m. Sunday and at our Ash Wednesday services, March 6. And a happy Friday to you. Counting down the days to Spring I am. It seems that every time I wash the salt, sand and dirt of winter off my car the last few weeks, it snows. For example, I washed the car again on Tuesday, and look - it snowed on Wednesday night. I do suppose I could stop washing my car but salt = rust. That's bad. If there is a connection between washing my car and it then snowing, please don't blame me. This Sunday, February 24, we gather at Trinity for Joint Worship at 11 a.m. As we worship, sing, pray and give our thanks to God, we also listen for God's call to us as we undertake the annual meeting of Trinity United immediately following an abbreviated worship service. Let us come together this Sunday to give our thanks. Trinity is your community of faith and we must have quorum for the meeting to take place. So, please be there to offer your wisdom, guidance and support to all who serve your community of faith. For people on email, you received the Annual report about 10 days or so ago. Please bring a copy of the report with you - on paper or on your mobile devices, so that we may undertake the business of the church. A few hard copies of the report were distributed at church last Sunday. Our Scripture reading this Sunday is from the Gospel of Luke, Chapter 6, verses 27-38. In this reading, we hear Jesus call us to love our enemies, bless those who curse us, give to everyone who begs from us and the well known verse "Do unto others as you would have them do to you." I have a few words to offer in a short reflection titled "Love in Action." Let's gather together to hear God's Living Words for us this Sunday. In case you will not be at Trinity this Sunday, do note that next Sunday, March 3, we gather at St. James for Joint Worship at 9:30. We shall worship and conduct the business of the church during the St. James Annual Meeting. A time of fellowship will follow. There will be Sunday school at Trinity this Sunday, February 24 - children go to school immediately upon arrival at church. Lent begins, March 6 - Ash Wednesday. Please join us at one of the two services we offer Ash Wednesday - either 3 p.m. or 6:30 p.m. 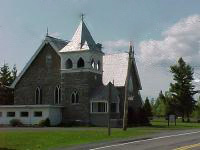 Both services are joint services and take place at St. James. I hope to see you this Sunday as well as next Sunday. It is important that we gather to give God our thanksgiving for our ministry in the world and to discern where God is leading us in our tomorrows. Blessings on your Friday and weekend. Happy Friday to you. What a beautiful day it is. The temperature is above freezing and there was rain this morning! Not freezing rain. Just good old rain. This is good. Or, this is how desperate I am to take comfort in what feels like a warm day. But, this beautiful day will pass and we'll be back to proper winter weather. Enjoy it while you can is my motto for the next few hours at least. This Sunday we gather to worship and be in community with one another: St. James at 9:30 a.m. and Trinity at 11 a.m. Do note there is no Sunday school at Trinity as it is a long weekend for some lucky folks. Younger folks are encouraged to be present at worship itself. Our scripture readings are from Jeremiah, Chapter 17, verses 5 through 10 and the Gospel of Luke, Chapter 6, verses 17 through 26. I am not yet sure what to make of our Scripture readings. In our first reading, the Prophet Jeremiah, speaking and acting on behalf of God, announces a series of curses and blessings on God's beloved people. We hear a similar theme in our Gospel reading which offers Luke's version of the Beatitudes. Unlike the Beatitudes offered in the Gospel of Matthew, Chapter 5, Luke's account of Jesus' Beatitudes also contain woes. Calling the poor, the hungry, those who mourn and the reviled, blessed, Luke records Jesus proclaiming woe to the rich, to the full, to those who laugh, and those who are popular. Ouch. Really? Let's get together to explore God's Living Words for us this Sunday. Do note that next Sunday, February 24, worship is Joint at Trinity, 11 a.m. Trinity annual congregational meeting will immediately follow an abbreviated worship service. Please plan to attend. And a happy Friday to you. May it be a good day. This Sunday we are invited to gather to worship, sing, pray, be in relationship with one another and God, learn and hear God's Living Words for us at St. James at 9:30 a.m. and Trinity at 11 a.m. I hope to see you on Sunday. Everyone is welcome for we gather at God's house. Our Scripture readings are from the book of the Prophet Isaiah , Chapter 6, verses 1 through 8 and from the Gospel of Luke, Chapter 5, verses 1 through 11. We again hear call stories. Stories in which God's people respond to God's call to follow and to serve. In our reading from Isaiah, verse 8, Isaiah writes, "Then I heard the voice of the Lord saying, "Whom shall I send, and who will go for us?" And I said, "Here am I; send me!" The same theme is picked up on in our Gospel reading, Jesus' call to Simon (later called by the name Peter), and to James and John, to put down their nets and follow Jesus in ministry in the world. Just ordinary people, hearing the call of God and responding to that call by following Jesus. We've heard these call stories many times over the years. We can probably identify times in our lives when we have felt "called" to leave things behind and move in new directions. Just ordinary people hearing God call to us to move in new ways. As I reflect on our readings for this Sunday, I think back to last Sunday and God's call to us. I offered the following "The Good News this day is that God does not just bless and love us who come to worship. God blesses and loves all people. All people! Those that are whole. Those that are broken. Here and everywhere. We are called by God to do the same as hard as it might be." As we ponder that "call," this Sunday I am reflecting upon how we might make that our reality. How might our church be "A Place of Mercy; A Place of Healing" for all people. That everyone might experience, for at least one hour in their week: acceptance, compassion, mercy, healing love, peace and grace. Wouldn't that be a wonderful place to spend one hour? Let's gather together this Sunday to hear God's Living Words for us. I note that St. James Community breakfast takes place tomorrow - Saturday - from 8 to 10 a.m. Wonderful conversation, great coffee and tea, laughter and a hearty breakfast. Bring your family, friends and neighbours for a time of community-making. Free-will offering. Blessings on your day and weekend. Good afternoon this beautiful first day of February. I trust you have had a fine week. Before I launch into the weekly email, a special note for Trinity folks - we have water and functioning bathroom facilities! Thank you Trevor for working hard to resolve the problems. Regular Trinity worship will take place this Sunday. We are invited to gather at worship this Sunday at St. James at 9:30 and Trinity at 11 a.m. We shall sing, pray, hear God's living words, be in relationship with one another and with God and Celebrate the Sacrament of Holy Communion. Please join us. Our Scripture readings this Sunday come from one of my favourite books (okay I do have many) of the Bible - Jeremiah, Chapter 1, verses 4 through 10 and the Gospel of Luke, Chapter 4, verses 20 through 30. I have commented in the past that Jeremiah was some strange dude - known to walk around naked, breaking clay pots, yelling at the people that doom is coming their way. Our reading from Jeremiah is a call story - God's call to Jeremiah to go out into the world to serve God and work to get God's people to re-turn to God. In our Gospel reading we get the second part of a two-part story that began last Sunday (the first part can be found here: https://lectionary.library.vanderbilt.edu/texts.php?id=109#gospel_reading). To say that Jesus preaches a barn-burner sermon doesn't do his words justice. He does that and so much more. And, surprise - the people he preached to were greatly ______? You fill in the blank. Let's gather together this Sunday to hear God's living words and to explore what they mean for us today. Blessings on your Friday and weekend. Wherever you may be or may be traveling to, may you journey with God. What a beautiful morning it was when I began writing this note. The sun actually felt warm today. After a storm-filled week, this morning was an absolute delight. Last Sunday we did have worship at St. James - 10 hearty folks came out and we sang, read, prayed and engaged with the Gospel reading sharing our thoughts on it. It was worship that was intimate, wonderful and sacred. Trinity worship was cancelled due to the storm as it only got worse. And with the winter storms, board meetings ended up being cancelled as well. But back into our routines we have moved. St. James worships this Sunday at 9:30 a.m. and Trinity at 11 a.m. Hope to see you there. This Sunday our Scripture readings are from the Book of Nehemiah, Chapter 8, verses 1-3, 5-6, 8-10 and the Gospel of Luke, Chapter 4, verses 14-21. It is not often we hear from the Book of Nehemiah. This passage records the day when, after the completion of the restoration of Jerusalem's walls, the people gather to hear the words of the Law read for the first time since their return. The physical restoration of Jerusalem stands as a symbol of and prelude to the spiritual restoration of its people, which will arise from a renewed relationship with God. Our Gospel reading is a two-part story. We hear the first part this Sunday and the second part on February 3. In the first part, Jesus is launching his public ministry. After teaching in several synagogues around Galilee, he arrives in Nazareth, "where he had been brought up." As Luke tells the story, this is the first place we hear Jesus' teaching - and so the scene functions as a kind of manifesto at the outset of his ministry. Indeed, apart from what he says to his parents as a twelve-year-old earlier in the story, these are the very first words we hear from Jesus in Luke's Gospel. And powerful words they are including: "...he has anointed me to bring good news to the poor. He has sent me to proclaim release to the captives and recovery of sight to the blind, to let the oppressed go free, to proclaim the year of the Lord's favor....Then he began to say to them, "Today this scripture has been fulfilled in your hearing." May we join together this Sunday to explore God's Living Words for us and to sing, pray and be in community. Blessings on your day and weekend wherever you may be and go. I am back and it's good to be back. A few weeks off to enjoy Sabbath rest, to swim, soak in the sun and simply be in awe of creation is sometimes just what the body and soul need after a wonderful but busy Season of Advent and Christmas. I've missed you all and look forward to seeing your friendly faces on Sunday morning. To all who led worship in my absence and attended to the pastoral needs of OKPC, my gratitude. This Sunday our Scripture readings are from Isaiah, Chapter 65, verses 1 thru 5 and the Gospel of John, Chapter 2, verses 1 through 11. Our Isaiah reading reminds the listener that even when the facts on the ground are terrible, God can surprise God's people with a new beginning. In our Gospel reading we hear how Jesus turned water into wine at a wedding banquet. It is the first of the seven public signs around which John organizes his account of Jesus' ministry. The "miracle" at the Wedding at Cana is an opening answer to the question, What is Jesus' mission all about? Grace upon Grace: An Abundance of Grace! I end this short note with congratulations to Kathryn and Ken Holman on the birth of their first granddaughter, Julie, born January 8! A brand new sister for Malcolm. God bless you all.